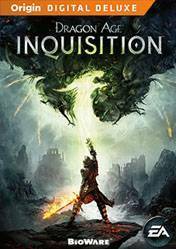 Dragon Age 3 or Dragon Age Inquisition is the upcoming release of EA set in one of the most famous RPG series. This new release promises to be more spectacular, with a bigger world and gameplay that surpasses any other title in the franchise. The Deluxe Edition comes with lots of extras, among which include: Freehold Celestial Throne, a single throne created from the skull of an ancient dragon. The red deer Halla: a beast with huge horns we can ride by inducing terror and go where we go. The Unicorn of the bog: another unique mount of the deluxe edition, which belonged to an evil villain. The original soundtrack of Dragon Age: Inquisition. And the most interesting extra, besides the mounts and the soundtrack is the Flames of the Inquisition gear, which includes multiple weapons for each class; and the Armor of the Inquisitor, with stunning visuals and a fantastic horse, a heavy horse with its own armor. A deluxe edition of the franchise fans should not miss. Dragon Age: Inquisition PS4 Gameplay - 8 reasons you'll love it!